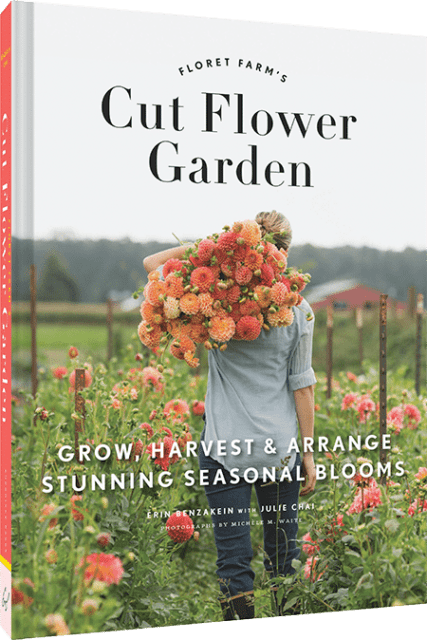 On March 7, 2017, Erin Benzakein of Floret Flower Farm will release her new book Cut Flower Garden. I actually preordered this book back in December. It was a Christmas gift from my mom and I can’t wait until next Tuesday. For those of you who are not familiar with Floret Flowers let me just tell you this lady and her family are amazing in the flower world. I have followed her for years and watched her flower business grow leaps and bounds. From the very beginning, she has shared so much of her trials and errors with those of us who are either just learning or have been in this field for a long time. She is so inspirational for flowers farmers and has helped to bring the business of flowers home to the USA. Her website is very informative with many resources for growing flowers. She has recently started selling her own seeds and bulbs which I’m sure is a thriving business in itself. She offers workshops at her flower farm in Washington State however they are almost always sold out as soon as she opens them up. Take a look at her website Floret Flowers. The photography is beautiful after all flowers are the subjects and plan on staying awhile because she has a lot of beneficial information. You can also order the book from her or other places such as Amazon and Barnes and Noble. Once I receive my book in the mail I will write another post on the book itself. Thanks to Erin, her family and her farm family for all of the hard work and information on all things flowers.